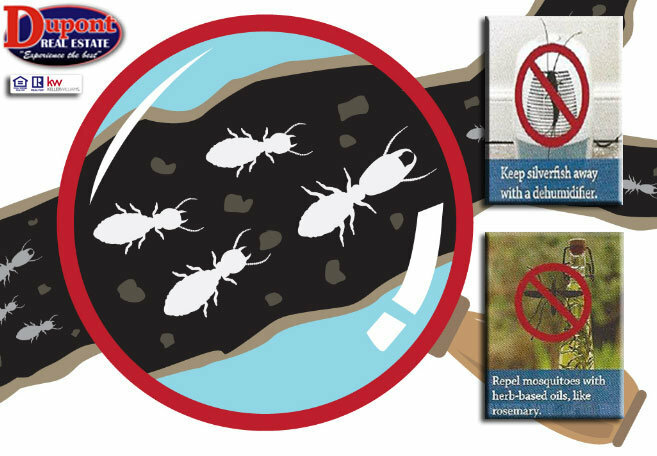 Making your home pests-free from ordinary household materials! Have you noticed more creepy-Crawlies in your house? The helpful experts at Brightnest.com feel the pain, and say these tips will help you get rid of them. Ants – Line suspected entryways with deterrents to get them in marching the other way. Natural options include cinnamon and cucumber, especially shavings from the peel. Spiders – Focus on their food source: insects. Use an insecticide to get rid of the bugs, and the spiders will go elsewhere for dinner. Cockroaches – Make a non-toxic trap by pouring water and soap into the bottom of the large jar. The water attracts them, the slippery surface will prevent them from going out, and the soap will kill them. Silverfish – These slinky guys love moisture, so your best bet is to manage the humidity of all areas of your home, including basements and attics, by using a dehumidifier. Don’t forget to ventilate the bathroom when the shower, and repair any plumbing leaks or damage caulk. Mosquitoes – Skeeters avoid certain herbs, so you can repel them naturally using herb-based oils, including cinnamon, rosemary, lemongrass, cedar, and clove or peppermint oils. Moths – Forget smelly mothballs, moths hate mint. Dry fresh mint leaves in the sun, place the dried leaves in small fabric bags, and place the bags in rooms where you’ve found moths to get them to hit the road. NEED HELP SELLING OR BUYING A HOME IN NORTH CAROLINA, SOUTH CAROLINA AND VIRGINIA, CALL FRANCINE at 704-506-8816 or visit dupontrealestate.com . Our client’s interest is our top priority!